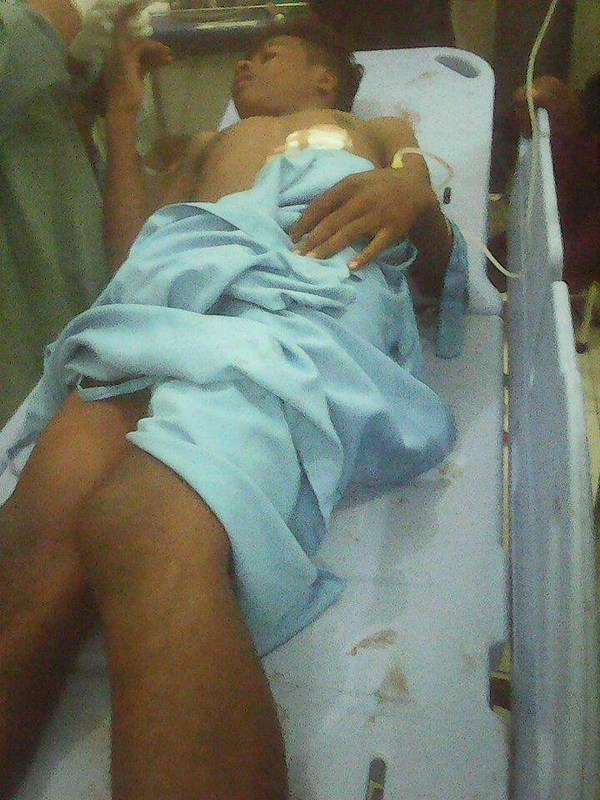 Monday evening, September 28, Indonesian Police shot two Senior High School Students in Gorong Gorong, Timika, West Papua. Around 7pm Kaleb Bogau (17 years old) was shot in the chest and died on the scene. Efrando Sabarofek (also 17 years old) was shot in the chest and leg and is in a critical condition in the Timika hospital. The family of Kaleb Bogau has treated this case as a political assassination. Kaleb Bogau was the son of KNPB (Committee National West Papua) activist Reverend Obed Bogau from Kingme Church. Kaleb Bogau body was taken from Timika hospital by his family to the KNPB office. Obed Bogau is also reported to have received a text message apology from Paulus Waterpau, the Regional Chief of Police (Kapolda), based in Jayapura, Papua. It is reported that Obed Bogau refused the apology message from Waterpau saying that Indonesia had killed so many Papuans and was treating them like animals. He asked the Police to properly investigate this case and, additionally, the recent killing of Kamoro students by military at a traditional ceremony in the Catholic church in Timika last month. The KNPB is a non-violent movement seeking Independence from Indonesia, comprising mostly youth and students who are active in all major centres across Papua. Within the past year there have been at least five cases of civilian shootings in Papua by soldiers or police force. A total of eight people have died as a result. “It is clearly time that our brothers and sisters in the Pacific and wider international community condemn Indonesia for its callous & vicious State control over the West Papuan people”. A witness says the two students who were shot were sitting with other friends in a public place near to the Biak residential housing complex in Gorong Gorong, Timika 28/09/15. This witness also reported that four police officers approached the group and one police officer asked if there was any trouble, intimating that the group of youths were making trouble. Other reports state that Police trucks came to the housing complex and questioned a civilian; “Where is young people who making the trouble situation here?” The housing complex was reportedly peaceful up to the time when the police arrived. The witness reported that the youth group began to move back to the nearby housing complex. The housing complex was reportedly surrounded by a large contingent of police, including three trucks, 15 motorbikes and three police cars. As a result Kaleb Bogau and Efrando Sabarofek ran reportedly scared from the police operation. Kaleb Bogau and Efrando Sabarofek and the others ran along the path toward the housing complex and then into a group of police. The three students were shot by police in different locations in this vicinity. Both of the serious shooting victims where then transferred by police to Timika hospital. The third victim is reported to have escaped with a less serious gunshot wound. Local witness in Gorong Gorong also report that when residents found out that Kaleb Bogau had been shot dead they tried to determine who had initially called the police to the site. Local people then staged a demonstration, which became a riot and one house was burnt. The Police who stayed on the scene then fired into the crowd, injuring three more persons one girl and two boys. These persons were reportedly not admitted to hospital as they feared for their safety. Another such incident recently in Timika highlights Indonesia’s intelligence operations against the KNPB. On Friday night 25/09/15 from 8pm until midnight a drone with a camera presumed to come from Indonesian Secret Intelligence Agency was seen hovering outside the KNPB office in Timika. This drone was shot down with a traditional bow and arrow. The drone was then identified as a Zyna brand drone with its control located across the street from the KNPB office. Today local people in Timika have staged a further demonstration as result of the police shooting. The Freeport copper mine, which is the worlds’ richest copper and gold mining deposit, is serviced from Timika. This region has a long held reputation for having the worse record of Human Rights abuses in Indonesia, primarily perpetrated by Indonesian police and military. Yesterday, Indonesian BRIMOB para-military police, are reported to have shot three Papuan men, who are now in a critical condition. This shooting has occurred after local people tried to negotiate an outcome from an incident where a truck driver has run-over and killed two Papuan youths, returning from a Church service early that morning. After the shooting a non-Papua resident has been killed, apparantly to avenge the Police action. Report produced by Yones Douw and Paula Makabory, Institute for Papuan Advocacy and Human Rights 07 May 2014 Chronology of events. On 5th May 2014, the Christian youths from the indigenous Kingmi Church of Kamu District, Moanemani, Dogiyai, conducted a Praise and worship in Digikotu Kingmi Church till the early morning. On 6th May 2014 at around 6am local time after the worship, a group of youths were on their way homes passing Epeida. Witnesses report that a truck travelling at high speed crossed to the wrong side of the road and crashed into the group. Two male youths were struck and killed at the scene as truck drove right over the top of them and sped away. It is reported that the victims stomachs burst out with their bellies went out on the road. The group of youths was reported to be walking on the left safe side of the road. The non-Papuan driver went directly from the scene past the nearby local police station to the Brimob (Paramilitary Police) Post in Moanemani. Such roadside incidents are not an uncommon occurrence in this region. Reportedly drunken Papuans have been deliberately run over in the past. 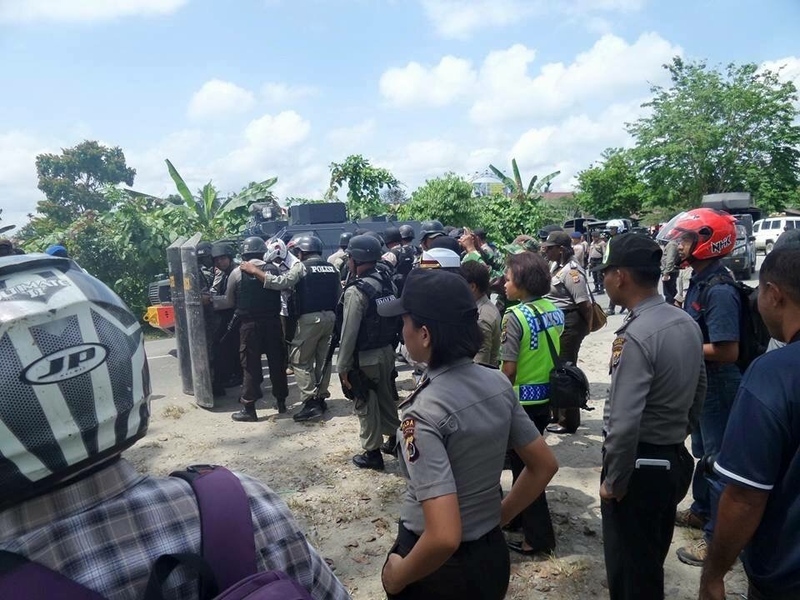 Around 10am local time, more than 100 family and kinsman of the dead teenagers, together with 4 local priest from the Kingme Church, went to the Brimob Post. The victim’s family asked the police for “secara keluarga” or negotiation with the driver to resolve the ‘accident’. ( This “secara keluarga” translates to talk in a family way to make a peaceful solution in a traditional customary way). With the priest the victims family and kinsman were seeking to negotiate a solution, which would have involved compensation, consistent with traditional law or custom. The Brimob officers at the post wouldn’t allow this negotiation process to occur. The people become very emotional at this point. Then it is reported that someone among the crowd of people began to throw stones smashing the glass windows of Brimob Post. Witnesses could not provide detail of who escalated the situation, though it is reported not to be a member of the victims’ family. The priests together with other members of crowd were active in efforts to maintain calm. After the windows were smashed the Brimob officers are then reported to have immediately began shooting automatic weapons into the crowd. The Brimob officers were reported as saying, “Mana kamu punya jago itu ayo tunjukkan jagoan kamu itu“, This translates to “Where are your guts, show your guts”. The shooting resulted in 3 Papuan relatives being shot and other people with injuries reportedly fled the scene. According to a priest, who was at the front of the crowd, the 3 victims were helping him to calm the people down when they were shot. He reports that Brimob shot the crowd not like 1 or 2 shots but shot like a rain (= automatic shooting). He said that he also should have got shot but the Lord protects him. 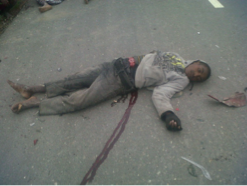 It is reported that to avenge the Police shooting, local people killed then a non-Papuan man. Around 12.30, the victims (the 3 Papuans and the dead non-Papuan}, who were accompanied by a Kingmi priest, were taken by plane to Nabire. From the airport they were taken straight to Siriwini public hospital. The three Papuan men were reported to be in a critical condition. 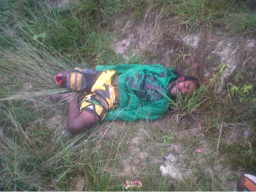 The body of the non-Papuan man, whose identity is unknown, is reported to have been taken by his family. The Papuan men critically injured were: Yulius Anouw S.Sos (27) was shot in his chest the bullet still stuck inside his body and was still in coma today. Gayus Auwe (32) was shot in his chest and his right thigh, the bullet is still inside his body and was today still waiting for surgery. Anton Edoway (28) was shot in his left tight the bullet penetrated and broken his leg bone and went out through the right side. According to locals, Indonesian security forces in Moanimani always face the Indigenous people with brutality. 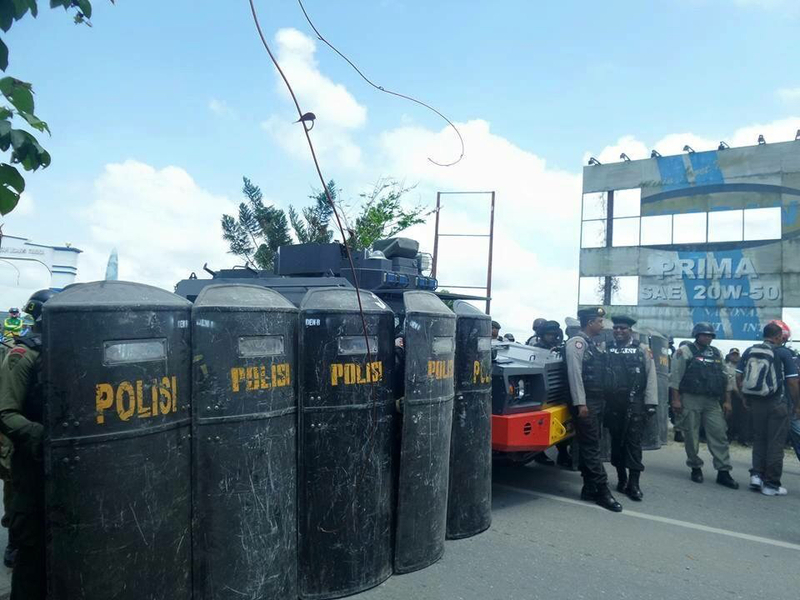 Moanemani has now been under full guard by Indonesian security forces with combined Army, Police, and Airforce troops. 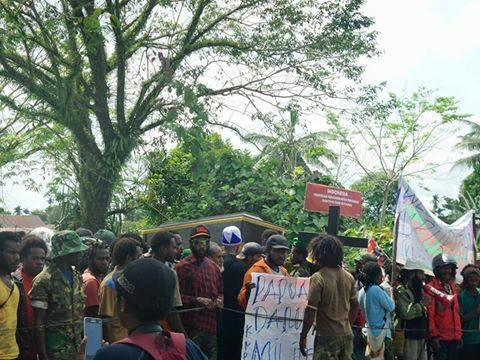 The non-Papuans population has gathering at the local Military Army Office in Moanemani. Reported by Yones Douw, Human Right Activist of Kingmi/Tabernacle Church from Nabire, Paniai, West Papua. The two victims died in the crime scene. 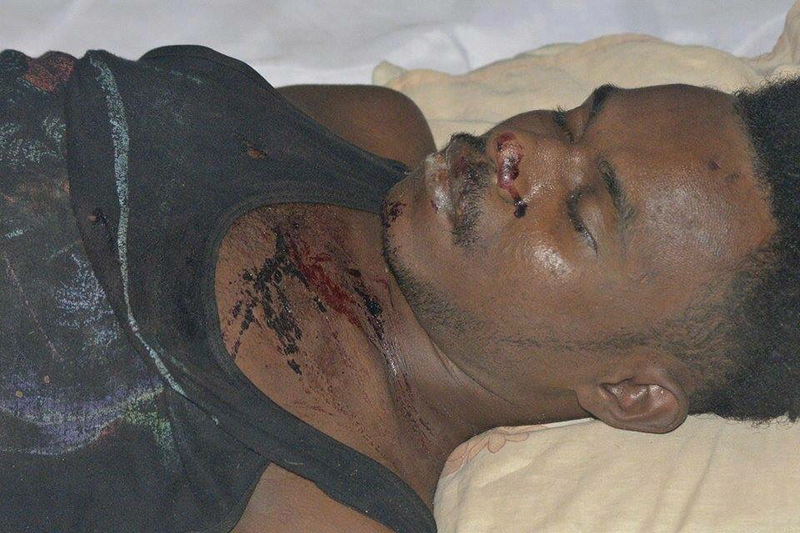 Yulius was shot in his chest, the bullet was in his body, it was taken out in Siriwini Public Hopsital, Nabire. Gayus was shot in his chest and his right tight, the bullet is still inside his body, still waiting for a surgery, in Siriwini Public Hospital, Nabire. Anthon was shot in his left tight and the bullet hit the left side and penetrated to the right side of his tight, he is suffering of a broken tight bone. He was under surgery in the Siriwini Hospital, still unconscious and in a critical condition. Download as a pdf Bloody_moanemani_incident_West_Papua. Saya kirimkan data kekerasan di Papua sejak tanggal 30 April – 22 Mei 2013. Saya kirimkan dalam dua bahasa; Indonesia dan Inggris. Silakan diperiksa dilampiran.